Family travel can be stressful under the best of circumstances, so it is important to understand the family-specific policies of any airline you plan to fly. While none of the airlines on this list go so far as having an in-flight nanny service like Etihad, let’s examine the family-friendly amenities offered by major long-haul and international carriers. My criteria for a family-friendly, long-haul international carrier is different from what I look for on short-haul and domestic flights. On longer flights, we are less concerned about baggage allowances, as most full-service carriers offer at least one free checked bag per person on international itineraries (though watch out for Basic Economy). Long-haul flights also board at a much more leisurely (or at least, time-consuming) pace than the quick turnarounds of short hauls, so priority boarding isn’t as big of an issue. Furthermore, I’ve found that many airlines’ official boarding procedures are thrown out the window at overseas destinations. When I chose an airline for travel on long-haul flights with children and infants, I want to see the choice of a special meal, the use of a bassinet and perhaps a fun amenity kit for my children that includes a few play things. It’s not necessarily that these amenities are so valuable (we can bring our own food and entertainment), but their presence is a strong indication that the crew will be family-friendly and trained to help. After all, you can’t expect the employees to go out of their way for families if their employers don’t bother. When using points and miles, I also want to avoid lap child fees, which are often 10% of regular fares, except as noted. In addition, some carriers even offer discounts on revenue fares for children under 12 years of age. Airlines that go out of their way to accommodate children. These are airlines, such as Air Canada, El Al, Lufthansa, ANA and, of course, Etihad, that offer special services and amenities for children. Expect your child to really enjoy the experience on these airlines. Airlines that just offer the minimum. These airlines may offer a children’s meal and perhaps some in-flight entertainment, but no special programs. These carriers include the three major US legacy carriers: American, Delta and United. Others in this group include Thai, Turkish and South African Airways. Some of these, like American, Thai and Copa, don’t even list special children’s meal options on their websites. Here’s a list of family travel policies by airline, and then read on to find some of my tips for traveling with your family on long-haul, international flights. Aeromexico — Its website has no information on children’s amenities. Lap children are $35 to/from the United States. Air Canada — Air Canada is now one of the most family-friendly carriers. It offers family check-in at select airports, and early boarding for families with children under 6 years old. It also assigns seats to families with children under 12 together for no extra charge. The airline offers child fares on international flights and lap child award fees are small on those international flights (between $50 and $125, depending on class of service or you can pay 5,000 to 12,500 miles). There are no infant fees on flights within Canada or between the US and Canada. Infant and children’s meals are provided on international flights, and children are give a logbook and a coloring book. On overseas flights, Air Canada will even give your kids will a backpack with an activity book and special earphones! Air New Zealand — This airline provides bassinets on long-haul aircraft. Children are offered an “Air New Zealand Jet Cadets” amenity pack including a kid-size headset and Jet Cadet lunchbox. Also offered are kid-friendly snacks and meals, plus a kids’ channel on in-flight entertainment. Interestingly, parents flying Air New Zealand can pay the unaccompanied minor fee to have their child sit in a different class of service. Note that Air New Zealand also offers a “SkyCouch” which can be very family-friendly. Air France — Air France offers children’s amenity packs in premium economy, business and first class. On flights lasting 2.5 hours or more, children aged 2 to 8 are offered a special kids’ meal, which is optional for children 9 to 11. Its Paris Charles de Gaulle hub also features children’s lounges. Finally, children’s fares are discounted by 15% on domestic flights, and 33% on medium and long-haul routes. Bassinets are available in all cabins. Aeroflot — This Russian carrier offer discounts for children occupying a seat and distributes special toys and games. The in-flight entertainment system includes a children’s channel with cartoons, movies, audio books, music and games for kids. It also offers activity packs and special meals for infants and children. In fact, on flights of three hours or more, Aeroflot offers meals to pre-school children at any time the parents want. 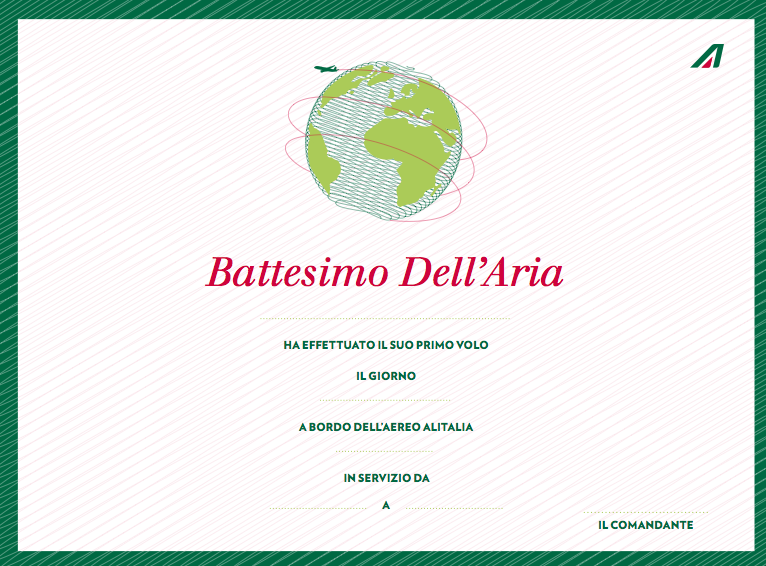 Alitalia rewards kids with a “first flight” certificate signed by the crew. Alitalia — This Italian carrier boasts several amenities for young travelers. There is the “Sala Young” lounge at Rome’s Leonardo da Vinci–Fiumicino Airport, and there are special infant and kid’s meals. Bassinets are available, and it even offers a cute First Flight Certificate that the crew will sign. American Airlines — American has bassinets available on a first-come, first-served basis at the gate for travel only on 777-200, 767-300, 777-300 and 787 aircraft, and not in business or first class. It offers special meals for children or infants, which you must request at least 24 hours in advance. And, thankfully, there are nice kids’ rooms at some of American’s Admirals Club lounges. ANA — ANA airlines, like many parts of Japan, is very family-friendly. It offers special airport support services for families with children under 3, which can be arranged in advance. Baby stroller rentals are provided free of charge, and bassinets are provided on all international aircraft for infants not occupying a seat, but families are asked to reserve these in advance. Children and baby meals are offered, and powdered milk, paper diapers, drinks for children, baby bottles, aprons, forks and spoons are also available onboard. Finally, ANA provides toys and other child-specific amenities. Asiana – They have a “Happy Mom Service” that offers “conveniences at boarding” and “in-flight breast-feeding” for mothers traveling with children under 2 years old. Other amenities include a baby bassinet, nursing cover and baby sling. And, anyone traveling with a child under 3 receives priority boarding and baggage claims services. There’s also a Family Service option available to passengers with two or more children under 7. There’s a $150 fee, but it includes a dedicated staff member at departure and arrival. Austrian — Austrian offers special infant and children’s meals, as well as bassinets and children’s amenity packs. Kids may also enroll in a special frequent flyer program called Jet Friends. British Airways — British Airways has the great policy of charging just 10% of the points for lap children on award bookings, as opposed to 10% of the dollars that most carriers charge. Even though BA charges seat selection fees to non-elites, it won’t seat children under 12 away from their parents. Also, seat selection is free for families traveling with an infant under 2 years old. Onboard, BA offers infant and children’s meals as well as “SkyFlyers activity packs” for flights longer than two hours. There are different packs, which include crayons, a coloring book, puzzles and sudokus, for different ages. Brussels — Brussels Airlines offers priority check-in, and security screening and boarding for families with children under 5. Cabin crew will warm up bottles and baby food, and there are in-flight entertainment options for children. It offers infant and children’s meals in Smurf boxes, as well as toys for purchase onboard. Cathay Pacific — Bassinets are available, and children 3 to 6 years old receive an amenity pack, including stationery, games and activity books. Special infant and children’s meals are available, complete with colorful utensils. Copa — Copa offers discounted fares for infants and children 2 to 11 occupying a seat, but little else in the way of amenities. Delta — Delta does not offer any special amenities for infants or children, other than children’s meals. Also, the airline no longer offers any children’s discounts. On recent Delta flights in business class, our children ages 2, 5 and 10 didn’t receive anything other than an adult amenity kit. El Al — This Israeli carrier sees a lot of family travel and offers bassinets for infants. In addition, crew will heat and rinse bottles and provide hot water. Children receive special meals as well as an activity book, and there is children-specific entertainment options onboard. Emirates — Emirates features special meals for infants and children. Its Young Flyers program offers families priority boarding, changing tables and complimentary stroller service at Dubai International Airport. There are special channels for kids on the in-flight entertainment system, and kids receive their own amenity pack. Emirates also offers discounted fares for children occupying a seat. The airline even offers a kid’s version of its frequent flyer program called Skywards Skysurfers. Etihad — In an apparent bid to become the most family-friendly airline, Etihad is going all-out. In addition to the over-the-top Flying Nanny service, Etihad offers bassinet service, family pre-boarding and dedicated family rooms for business and first class passengers at Abu Dhabi and other select cities. Child and infant meals are available and children are also offered an amenity pack as well as age-appropriate television shows, movies, music and video games. EVA – The airline offers three kinds of infant and children’s meals, but the real highlight is the Hello Kitty flights between Taipei and Los Angeles or Paris. These flights feature aircraft with special paint jobs, as well as branded items onboard. Finnair — It offer bassinets, meals for children and toys as well as dedicated in-flight entertainment options. Iberia — Iberia offers special meals for children and infants, and has an Iberia Plus Kids frequent flyer program. It also offers discounted fares for children under 12. Japan Airlines (JAL) — JAL offers bassinets, diapers and a choice of baby meals (including a bib) and children’s meals. Toys and games are given away, and picture books can be borrowed. Some families also with children under 16, or a family member 60 or older, receive special assistance at check-in, transfer or arrival. Korean – This airline offers infant and child meals as well as bassinets. I’ve also read reports of toys being given out and especially helpful crewmembers. KLM — KLM offers its Bluey for Children program that includes children’s amenities and special meal boxes for infants and children. Bassinets are also available and there is a Junior Jet lounge for kids in Amsterdam. LATAM — We discovered the hard way that infants are not allowed to travel as lap children in business class on LATAM, despite British Airways issuing us a lap child award ticket! Although LATAM wouldn’t honor our tickets, we were re-accommodated at no charge on American. That said, lap children are allowed in coach, and LATAM does offer children’s meals. In fact, the crew was fantastic on a short-haul flight within Argentina that we took with our infant daughter. Lufthansa — Lufthansa has become our family’s favorite long-haul carrier for several reasons. On our first long-haul flight with our oldest child, three flight attendants erected the bassinet and made it up with fresh linens. Lufthansa offers great amenity kits for infants and kids, and special children’s meals from a celebrity chef. In fact, our daughter has kept many of the toys she has received from the airline over the years. Other services include a special family check-in areas at Frankfurt and Munich airports. Malaysia — This airline made a lot of news by banning kids from the upper deck of its A380. This section includes eight first class seats and much of coach. Nevertheless, this policy doesn’t affect the coach and business class seats on the lower deck, or any seats in other aircraft. In addition, the airline appears to offer several special services for infants and children, including priority boarding, entertainment, food and well-stocked child care facilities at the airport. Qantas — This Australian carrier offers a range of children’s amenities, special “Joey Club Zones” in lounges and dedicated in-flight entertainment for kids. Child, toddler and baby meals are also available. Royal Jordanian — The airline offers special meals for both infant and children, special amenities and kids’ programming on its in-flight entertainment system. Bassinets are also available. Singapore — Singapore features several different options for children’s meals, and some even fancier choices for some lucky kids sitting in Suites, business and first class. Bassinets are also available. South African Airways — It offers priority boarding as well as infant meals and bassinets, but doesn’t appear to offer any other special amenities for families and children, other than some movies for kids. SWISS — Swiss offers special children’s meals and entertainment options. In addition, there are dedicated family check-in areas in Zurich, along with children’s lounges with play areas. Bassinets are also available. Finally, there’s even a SWISS Kids website that shows all of the special meals and activities that kids can expect. Thai – Thai offers bassinets for infants, and children’s entertainment options but it doesn’t show any special meals or amenities for children on its website. Turkish — Turkish Airlines offers baby and child meals, and has recently started offering a kids’ amenity pack with toys designed using all natural materials rather than plastics. United — United may have a bassinet available on some flights, but otherwise you are on your own. Its website curtly informs parents, “If you are traveling with an infant, please be sure to bring enough food and supplies with you. Our flights are not equipped to heat baby bottles.” And while “United strives to seat children under age 15 with an accompanying adult family member,” they encourage you to pay for the privilege or “your family or group may be split.” Thankfully, there are children’s meals available. While we’ve had some good experiences, we’ve also had at least as many instances of particularly poor service from crewmembers on United, and judging by reports from other families, we are not alone. Virgin Atlantic — This airline offers bassinets, baby meals and in-flight entertainment options for kids. There is also a special kids’ menu featuring fish sticks, pizza and chocolate. It also offers lap child awards in points: 1,500 Miles for Upper Class, 750 miles for Premium Economy and 200 miles for Economy. Virgin Australia — Virgin Australia offers reduced-price children’s tickets for international flights, just not in business class to North America. Airports include a mother’s/parent’s room. Special children’s meals are available and its website claims that “cabin crew will heat bottles and assist you with preparing and washing bottles or pacifiers.” It also offers some surprising family benefits in its Velocity frequent flyer program such as parental leave that pauses elite status and four guaranteed award seats for an annual family trip for Platinum and Gold elites. 1. Reserve seats, meals and bassinets in advance. You would think that airlines know your child’s birth date and could plan in advance for the flight, but that’s not the case. Every airline that I looked at that offered special accommodations for infants and children required parents to notify the carrier in advance to request these amenities. The reservations are typically required from 24 to 72 hours in advance. Just including your child’s date of birth in the reservation is not sufficient. 2. Remember that you can only sit one infant per row and per adult. The FAA and other international regulators prohibit multiple lap children from occupying a row, so as to ensure that there are enough oxygen masks in the event they are needed. The problem, once again, is that even though the airlines know the age of its passengers, the computer systems will usually permit seat assignments that violate this rule. As a result, parents may only be informed of this regulation by flight attendants and will be forced to switch seats and be separated. And since the airline had the passengers’ ages and permitted the seat assignments, it can appear as if it’s just another rogue flight attendant just making up a rule. So if you’re traveling with more than one infant, be sure to get advanced seat assignments in separate, but nearby, rows. 3. Bring your own infant meals. Many international airlines offer some form of an infant meal, but it should only be seen as a backup, at best. Even when supplying meals, most carriers strongly encourage parents to pack their own infant food that they know their child will eat. 4. Always ask about children’s fares. If you’re purchasing a revenue ticket for any member of your family, ask about children’s fares. Many airlines offer discounts for children 12 and under, but these policies are sometimes poorly disclosed and usually require you to book by phone. I did my best to mention airlines that offer these child fares, but other carriers may have unpublished discounts. 5. Prepare for cancellations and diversions. I was once on a layover in Chicago with my daughter when our international flight was canceled. Knowing this was always a possibility, we had carried on just enough clothes for a Chicago winter and even a bathing suit for use in a hotel pool. While I was disappointed that our trip had been delayed for a day, my daughter has fond memories of spending that day in the hotel pool! You should also carry-on enough food, diapers and medications to last not just how long your flight is scheduled, but for the worst-case scenario. 6. Try to stay positive. The service families receive may occasionally surprise you. For example, American Airlines has the fewest children’s amenities of any airline I researched (and ranked relatively low in the 2018 TPG Best Airlines for Families report), yet we once received great service from a particular flight attendant during a weather hold in Buenos Aires. The flight attendant paid special attention to our then-5-year-old daughter during the two-hour delay and even invited us up to the cockpit while the aircraft was at the gate. My daughter enjoyed it almost as much as I did! Some airlines go above and beyond to ensure that your child has a comfortable and safe long-haul flight to an international destination. Other airlines aren’t quite as helpful. Which air carriers has your family flown for a long-haul flight? Did your kids receive special meals or amenities?